We are honored to be able to announce that we will be standing Sir Knight Shadow at our farm here in Flamborough Ontario. This magnificently put together true black sabino stallion is registered with the Jockey Club and stands at 16 H.
He is a son of the famous jumper / dressage stallion Prince Stanley. His training in natural horsemanship is evident when it comes to the breeding shed as he actually goes through quite the courting process with his mares. He is a treat to ride, handle and have in our barn and we couldn't have made a better choice when it came to purchasing him. He has been DNA'd and his results are EE aa. He has four white socks and a nicely set blaze down his entire face. He possesses a nice soft, kind eye and is very nice indeed to ride. His foal of 2011, Roxie, seems to have inherited his easy way of going. 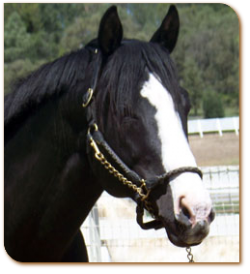 We have set his stud fees at $800.00 plus $200.00 booking fee with a two year live foal guarantee.